1) You want the sharpest image possible, that your camera will allow. 2) You want the largest size image file size possible, that your camera will allow. 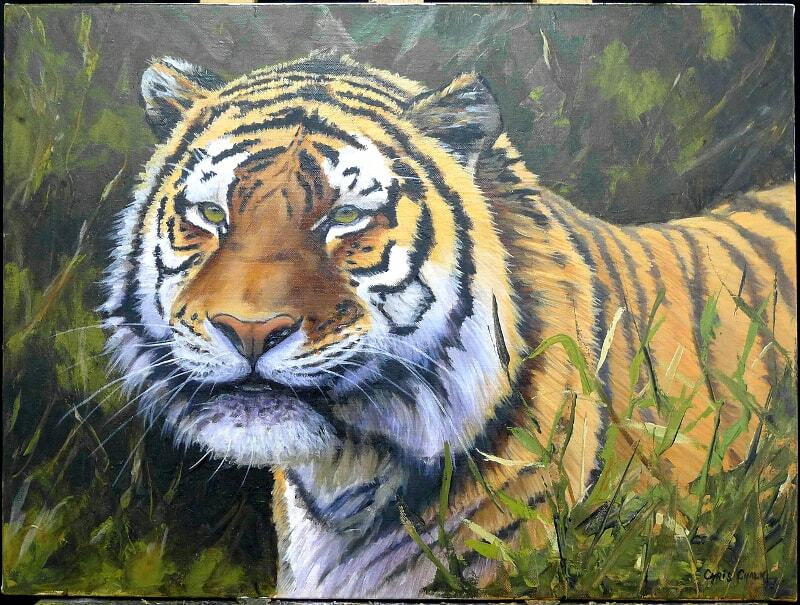 3) You want to avoid any unwanted light reflection or colour reflection cast across the painting you’re photographing. Obviously the quality of your final image is going to be somewhat dependant on the quality of your camera equipment, the more high-end your camera, the easier it will be to get good quality images. That said, you do not need to spend a lot of money on expensive camera equipment to get great quality images of your artwork. The camera I use for my own artwork photography is a Sony Panasonic DMC-LX5, which is a high-end compact camera, and cost about £400 new. 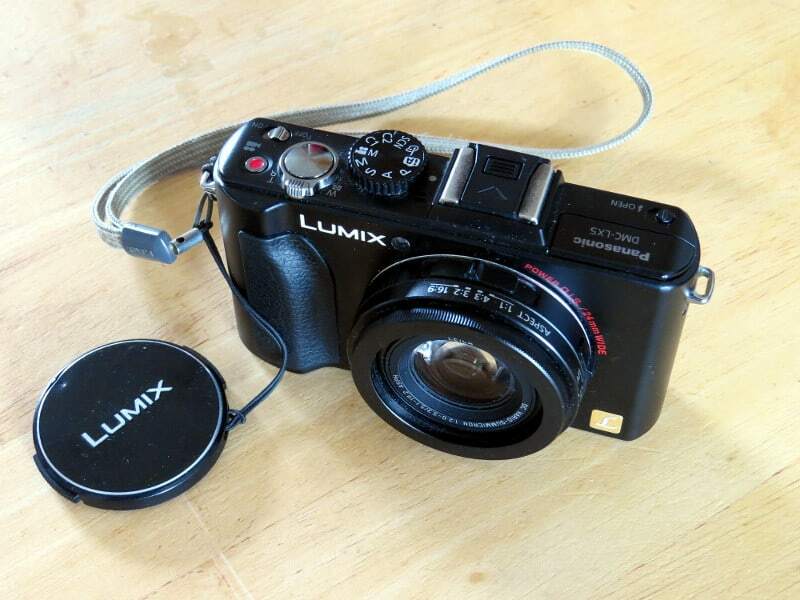 If you have a cheaper camera, this will mean it has cheaper hardware inside it, a cheaper lens, and as such it will generally take lower quality images. But, don’t be put off too much if this is your situation, because as important as the quality of your camera ( and in most cases, much MORE important ) is how you go about lighting your artwork for photography. Generally, a less expensive camera will require more light to take sharp photographs of your work. I’ve tried many different cameras to photograph my paintings over the years, some cheap models and some very expensive models, and some of my best results were with the cheaper cameras, …but only if I got the lighting right. Natural light is best. Although indoor lighting seems very bright to our human eyes, to a camera’s sensor, it’s hopeless. You can test this by taking a photograph indoors under artificial lighting, and then looking at the camera telemetry to see what the shutter speed was for that photograph. Then take another photograph outside, even on a fairly dull day, and look again at the camera telemetry. The shutter speed for the photograph taken outside will be much faster ( i.e the percentage of 1 second that the shutter was open when taking that photograph eg. 500/1 second ) than the photograph taken inside – generally, the more light, the better your camera will work, the faster the shutter speed be, the sharper the resultant image. A) Outside on a dull day. B) Outside on a bright but overcast day. C) Outside on a bright day. D) Indoors in natural light. E) Indoors under artificial light. The worst kind of light for photographing paintings is usually under bright direct sunlight. When the sunlight is too harsh, it bounces back off of the whites in your painting, and will tend to overwhelm the camera sensor. You end up with washed out ( whited out ) areas in your photograph – not good. 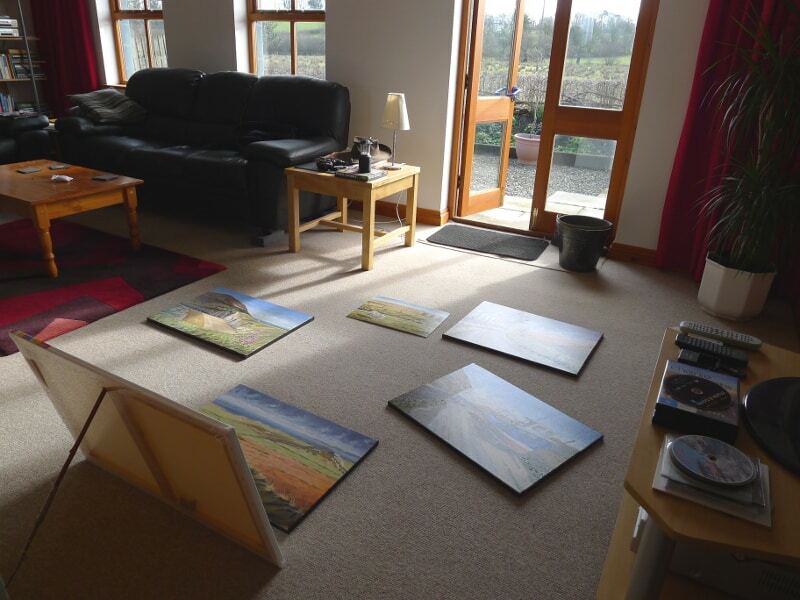 Photographing paintings, with blank canvas being used to reflect more natural light back and down into the painting. I photograph all of my paintings in the manner you can see in the photograph above. The French windows face south. I place my paintings on the floor in front of these French windows, and depending on the time of day, which of course governs where the direct sunlight will be falling, I move the paintings left or right to keep them OUT of the direct sunlight. At the bottom of this photograph you can see I use a blank white canvas, propped up at an angle, to reflect more light back, and down, onto the painting I’m photographing. I stand behind the propped-up reflector canvas, and shoot looking directly down on top of the painting. Through trial and error, I know that if there is enough light in the room to take the photograph at least 1/250 of a second shutter speed, it will be a sharp, clear, reflection free, high quality image. Fill your viewfinder with the painting you are photographing, and use a little bit of zoom if you need, to achieve this. Not doing this, is a common mistake a lot of people make when photographing their work. NB. The more of your final image you have to crop-off ( because it isn’t actually painting, but carpet, or wall, or whatever else was around you painting when you took the photo ), the smaller your image will be in megabyte size. Badly filled view finder – lot of wasted mega pixels, just photographing what’s around the actual painting. Correctly filled view finder – I’ve used nearly all of the camera’s mega pixels here photographing ACTUAL painting. Avoid reflections of any kind. It’s very easy to set your painting up perfectly, take a beautifully sharp photograph, then when you look at the image on your computer you notice that there is a coloured area or stripe across your image, or a dark line across your image, or a bright line even. That is probably because there is a window, a car, a coloured wall, bucket, ..anything really, casting a reflection across your canvas and that you didn’t notice when you took the photograph. Look out for this, and relocate your painting, or the object causing the reflection. 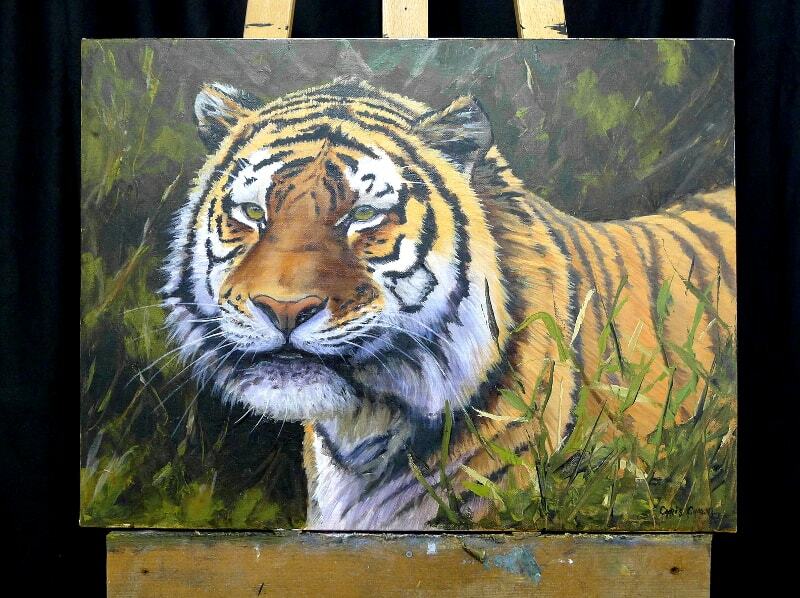 As a case in point, take another look at the tiger painting in the photograph above. You’ll notice that there is a glare across the top half of the painting ( very bad form ) which was caused by my daylight lamp in my studio. I took these photographs to help explain my point about filling the camera’s viewfinder, but coincidentally it also explains the reflection problem we can face when taking photographs of our work. The glare wasn’t strictly caused by a reflection off of another surface, but in fact direct light coming from a very directional source, but it’s the same principle, and needs to be avoided. Once you have the best possible image you can get using the methods above, the next step is to edit your image in image editing software to add the final touches, such as sharpening, altering the contrast and colour balance e.t.c.. to match the original painting. Be aware that you can only work in image editing software with what you already have, and that even the very best image editing software will not be able to fix a poor blurry badly lit initial image. I’ll write a future blog post on how to edit your images for those final touches using GIMP, free open source image editing software available to download here.